The Overseas Lunch Club, post lunch. Photo by Jeralyn Gerba. We took a two-hour detour to Kinsale on a whim, after a fishmonger in Cork tipped us off to proper fish and chips. You have to be flexible when you’re on a self-made Slow Food tour of Ireland, and give yourself plenty of time to digest between a blood sausage breakfast and a lap at the Butter Museum. The destination: Fishy Fishy, a bustling lunch spot in a picturesque medieval harbor, which is also a port of call for yachters, anglers, and golfers. The boating fraternity hadn’t yet thrown down their anchors in June, but there was a summertime hum in the air. We put our name on the waiting list and toured a few shops in the village. I considered it a very good omen that there were none of those touristy trinket stalls — the kind that sell thimbles, wind chimes, and glass sculptures of the Blarney Stone. Instead, we found handmade wooden toys and streamlined Scandinavian-style homewares. We made some purchases (inevitable), circled back to the restaurant, and slipped into seats on the upstairs patio just as the sun settled into the afternoon. There was a lot of anticipation (did I mention we drove two hours for lunch? ), and the day’s catch lived up to it: crisp local oysters; small steamed clams with sesame, chili, and spring onions; a killer seafood chowder; and a battered cod so light it levitated. We refilled our beer glasses and toasted at least three times. 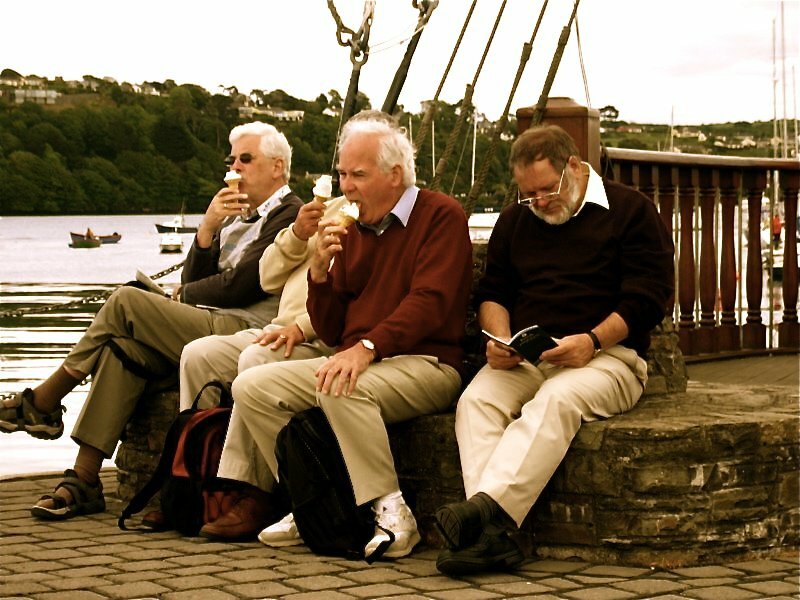 After lunch we ambled to the docks across the street, where we noticed four older gents enjoying ice cream cones with a kind of confidence that said: We have been eating ice cream cones together since the beginning of time. I snuck a picture when they weren't looking. Then I ordered a scoop out of deference. We chatted a bit and they revealed that they were traveling as an Overseas Lunch Club (running strong for four decades!). The foodie foursome meets annually in various dining rooms around the UK, Italy, and France, but this little joint in southern Ireland always ends up on the short list. We all looked over at the restaurant patio, and — in silence — added our intentions. Then I inhaled the last of my cone, said my goodbyes, and got into the car. We had dinner plans halfway across the country. No further explanation necessary. Martin's Mad About Fish, a video cooking series from Fishy Fishy's chef-owner.